Delhi Police MTS Jobs of Cook, Water Carrier, Sweeper, Dhobi Vacancies Recruitment Exam Notification 2018 Apply Online @Delhipolicerecruitment.nic.in. 17-12-2017 to 16-01-2018. Online applications will accepts through official recruitment website of Delhi police @www.delhipolicerecruitment.in. 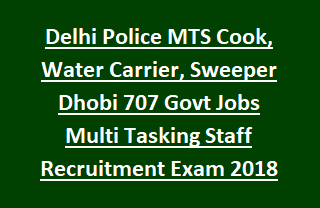 There are total 707 Multi Tasking Staff vacancies in this Delhi Police MTS Jobs recruitment 2018. Available vacancies are Cook, Water Carrier, Sweeper (Safai Karmachari), Dhobi, Mochi, Tailor, Barber, Carpenter, Drafti and Mali (Gardner) Jobs. Candidates will be selected through written exam and trade tests for this Delhi Police MTS Jobs. More details about this Delhi Police Multi Tasking Staff Vacancies, exam pattern, age limits, no of posts and other details are given below. As on 16-01-2018 age limits for Delhi Police multi tasking staff vacancies is 18-27 years for general candidates, 18-30 years for OBC and 18-32 years for SC/ST candidates. For PWD candidates UR-35 years, OBC-38 years and for SC/ST 40 years. Candidates must have qualified Matriculation or SSC or 10th class or ITI from any recognized board. For application fee details refer official notification. Candidates will be selected through written exam and trade tests for these Delhi Police Multi Tasking Staff vacancies. Eligible and interested candidates may apply online for these MTS vacancies of Delhi Police online on or before 16-01-2018. Online application will be accepted through official website of Delhi police @www.delhipolicerecruitment.in. Delhi police MTS admit card, result, exam syllabus information also available in this website.